As much as I love watching and photographing short-eared owls, I was starting to yearn for a change of subject, and after another trip to the owls which ended up with no photos gained, I was pleased to see a text come through from Dave, about the desert wheatear on Clee Hill. He'd been up during the day, but the light was poor and wanted to return. 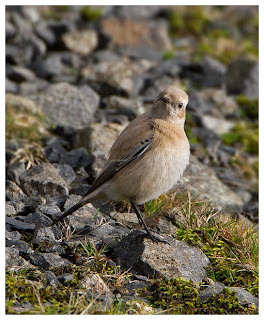 We agreed to meet as soon as possible after the bird had been reported, and he rolled up moments after I'd almost been blown off the side of the hill, having opened the car door to get the gear out. Dave informed me then that it was less windy than the day before! Unlike before, the sun was out, and a small crowd of birders observing the bird made finding it very easy. Among the crowd were Chris and Bob, though I'm surprised I saw them at all, as both were clad from head to toe in camo gear! It was good to see them again, as it has been a few months since we last bumped into each other, and both are entertaining to talk to. 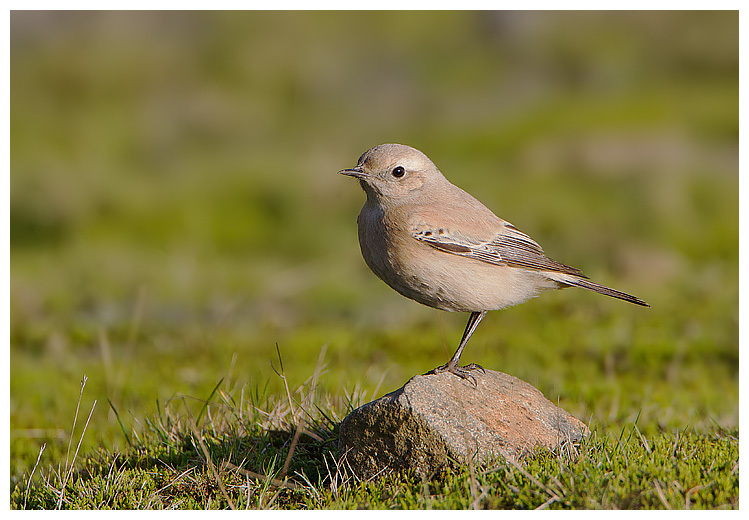 The wheatear, meanwhile was feeding on the steep slopes around the corner from us, so it was a bit of waiting game. Made easier mind, by watching the movements of the birders, who would suddenly grab their gear and head in our direction, meaning the bird was on the move. 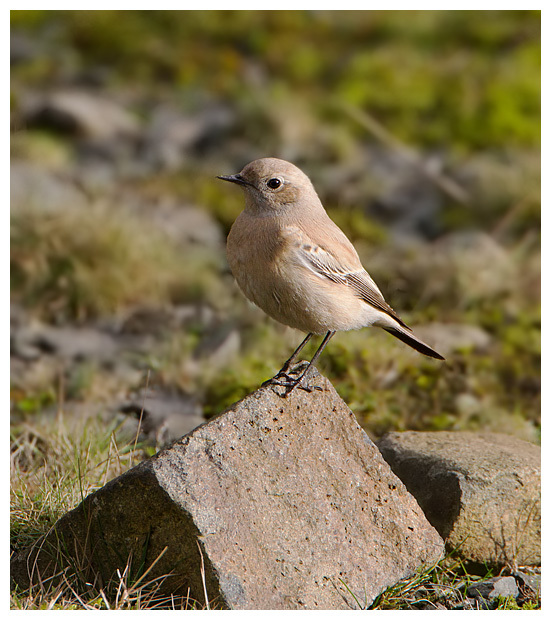 Now Clee Hill is a great spot for wheatears in the summer, but obviously in the colder months they're somewhat missed. 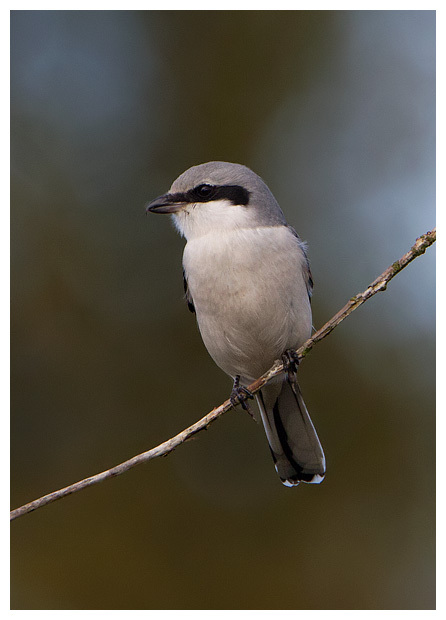 This made up for it, as it flew into view and started turning over small fragments of rocks, digging its beak into the soil and grabbing at insects and grubs uncovered. Between feeding, it would perch on something raised up, perhaps a boulder or a pile of rubble. I think it was slightly bemused by the shutters going off, everytime it stopped moving! It came pretty close at times, but any movement seemed to spook it off, back to the slopes, and the waiting game commenced once more. Whilst waiting we watched crows and ravens soar overhead, gliding on the breeze. An eagle-eyed birder then spotted a short-eared owl come in, from fairly high up, and it tried to land and settle on the top of the hill, but the corvids chased it up and over the top, to be lost from view. Plus we were treated to a brief fly-by from a female peregrine falcon. Occasionally, when the wheatear took longer than usual to return, we'd go for a walk to try to locate it, but invariably we'd end up back where we'd left, to watch it fly in, hop around, feed and then zip off once more. By mid afternoon, Dave had to leave to tend to his parrot (I kid you not!) and the wheatear dropped in moments later (as Dave said it would), for a last pose. 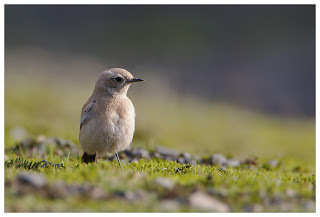 We followed it down the hill a bit, but I was by then also clock-watching, so said goodbye to both Chris and Bob, and left them to chase the wheatear, while I relished the shelter from the wind in my car. 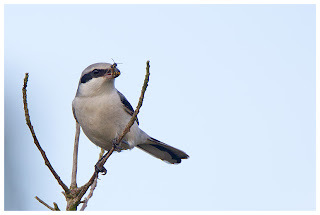 A new tick for me, and pleasant change too. Having enjoyed a wonderful session at a site in Northants, I was eager to return, and cashing in some owed time off from work, I persuaded Dad to accompany me again to the location. Not that he needed much persuasion! It was a fine sunny morning when we set off but by the time we had arrived, it had clouded over - though the weather was supposed to clear, and so it did over lunch. 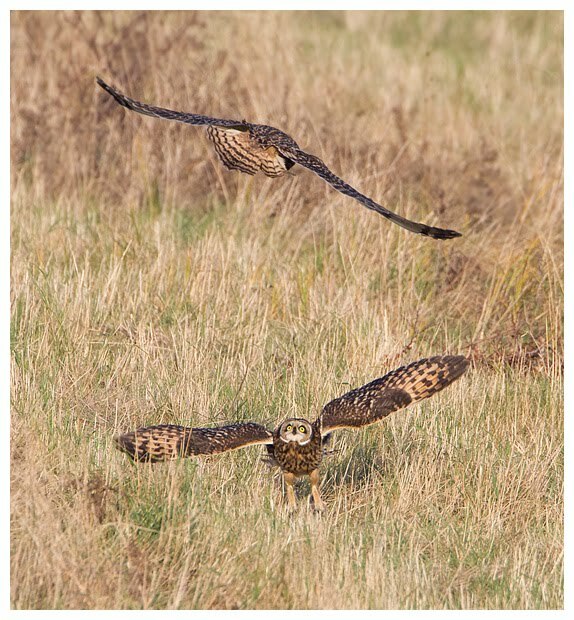 As before, there were flocks of fieldfare, larks and pipits around, but frustratingly, the owls refused to come out to play. By mid afternoon, I was beginning to think I'd made a mistake coming, but I wasn't alone, as several other cars had arrived and set up in anticipation. 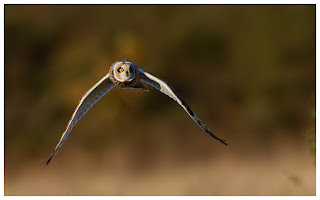 Probably to stop his legs from seizing up, Dad wandered along the track, and put an owl up! Didn't fly far, and dropped into the field. 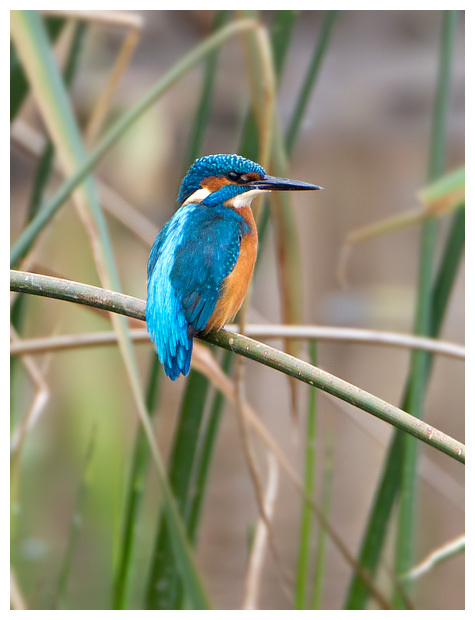 But I could then see it sat in the grass, and watched it as it preened, ruffled its feathers, looked all around, constantly and then finally, took flight. 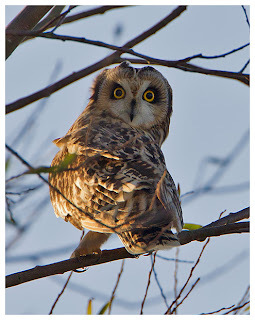 Immediately, another flew at it, and it was like an alarm clock had sounded, and all the owls took off at the same time! With the sun still out, the light was good, and we were treated to a very close flyby by a pair, one of which perched in a nearby tree. The view was slightly obscured, but the glare we got was almost scary! Then for the next 90 mins or so, the owls flew around the fields in front and behind us, not bickering as much as before, but still calling and occasionally pouncing or swooping down for a catch. At one point, which was a real buzz, one turned and flew directly down the field at me. I have to admit to panicking for a couple of seconds when the focus wouldn't lock on but when it did, I had time for a couple of shots before the owl changed direction and flew away again. With the autumnal colours from the trees behind, and sunlight on the birds, I have to say I'm rather pleased with the resulting shots. Arguably my best yet in flight. 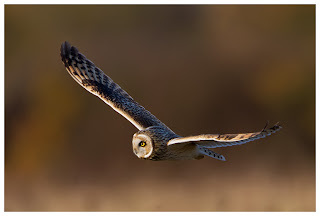 Needless to say I returned again the following day, though the light never really materialised, and the owls came out even later. The highlight though, if you can call it that, was seeing one perched in a tree. It was almost dark though, but because I didn't have my converter on, I was able to open the lens up to F4, whack the ISO up to 1000 and bring the speed down to 1/100th, and hope. It came out remarkably well and is close to a full frame shot in portrait format. I think I might have to go again... and again! For the non-owl-lovers, you might need to look elsewhere for a few blog entries! 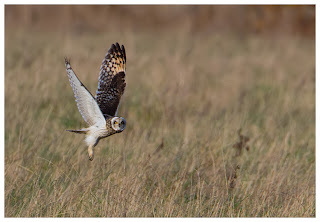 After dipping on the short-eared owls in Northants a fortnight ago, and then having to host a firework party and hence lose the whole weekend to that, I was itching to get out again to catch up with these winter visitors. 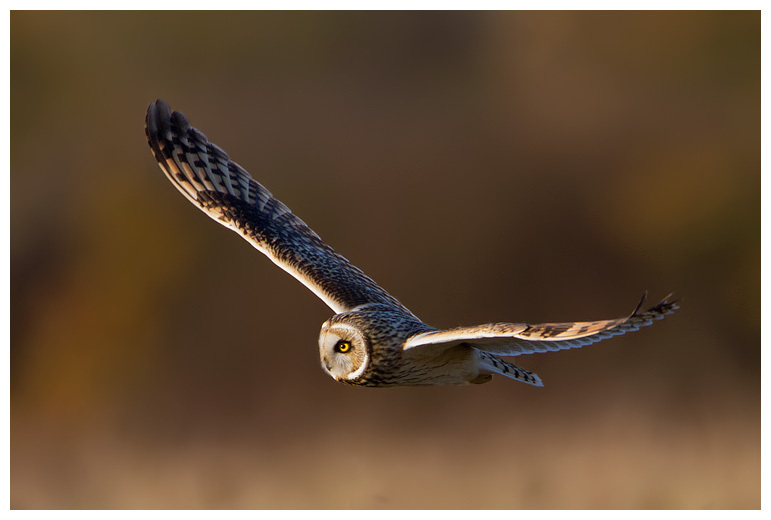 I had a choice, between a site north of Birmingham, which was closest, or another in Northants, which had more owls on offer. I chose the latter, mainly because a number of friends live locally, and were also going that way. So just after lunch on Saturday, I arrived earlier than planned, and decided to go for a walk around the area - better than waiting in the car! Proved to be a good move, as within 5 mins of wandering along a track, I spotted a short-eared owl out, already hunting over a field. Excellent. Getting close was a problem though, as there was no cover, so I had to wait for the bird to land, and try to creep a bit closer. Unfortunately, the bird chose to hunt a bit further away each time I did, so I ended up with some distant shots, though I did enjoy watching it successfully catch (and carry off) three voles. 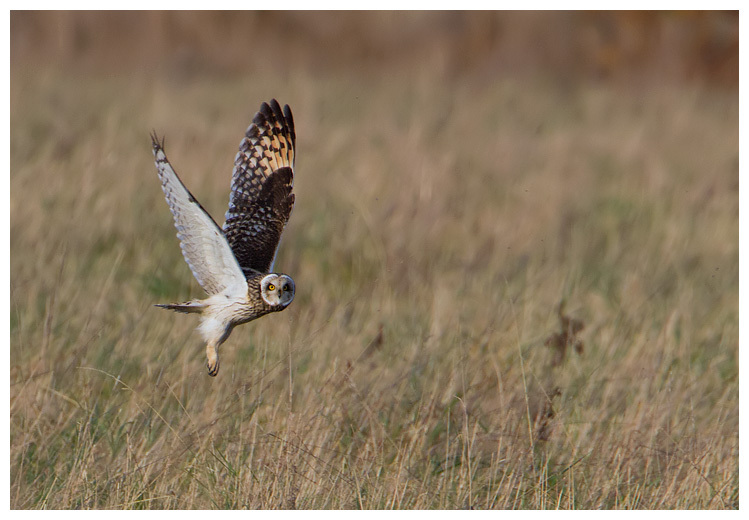 After an hour's hunting, the shortie dropped into the grasses and failed to reappear, so I stood watching the flocks of fieldfare cackling as they flew over in their hundreds. 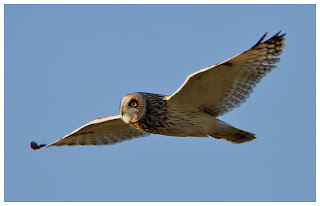 Then another stroke of luck, as a local birder arrived, and I got chatting, and followed him round to another field, where he explained, the owls generally gathered. And did they gather! By the time we'd walked to the "best spot", we could see 5 owls out, and within 30 mins of that, there were at least another 7 around. I've never seen so many, and it was wonderful. 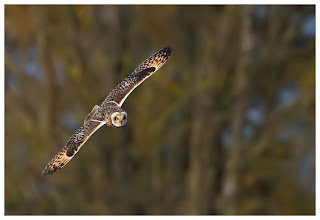 Most of my friends had now arrived, but favoured the other side (avoiding the long walk) but Karen and Paul had followed me round, and were treated to an awesome display by the owls. 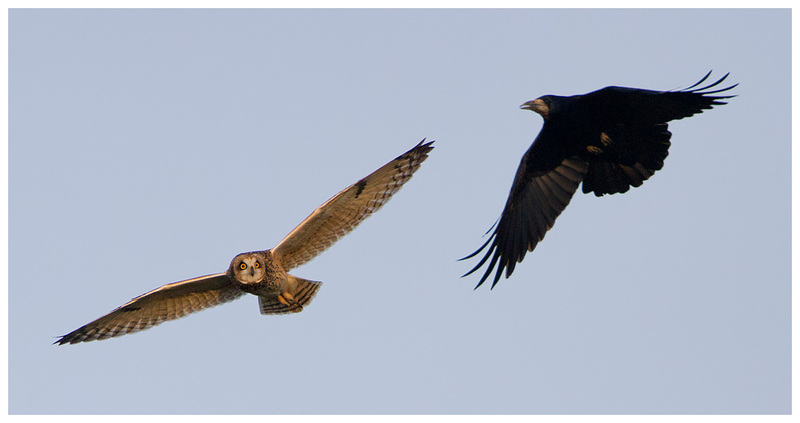 They were hunting, fighting between each other and also being chased by resident birds, such as rooks. For about an hour it looked like the skies would clear and bathe the area in sunlight, but a big bank of cloud arrived to spoil the party, and it quickly went dark, leaving us all wanting more. But it was Saturday, so Sunday's plans had already been booked! Sunday brought fog first thing, but by the time I'd collected Dad to take him along, it was sunny and looking promising. When I arrived on site, some of my friends were already there (keen!) and Ian soon joined us too. Unlike Saturday though, we had a longer wait for the stars to appear, possibly because they'd eaten well the day before (Friday was very wet, so they would have been hungry on Saturday). And when they did come out to play, they favoured the middle of the field, though on odd occasions they ventured a bit closer. Also noticeable was that fewer hunted at the same time. Not that they stopped squabbling! 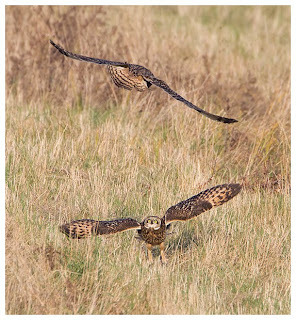 Was fantastic to watch them chase each other, sometimes forcing one to land, and then swooping down low, divebombing the grounded bird. As before, the light faded quickly, and took with it our chances of more shots, but no-one was unhappy after a weekend like that. Needless to say, I will be going back, whenever I can to watch and photograph these magical birds. Great to have them in the Midlands, and saves me driving miles up north to see them. Into November already, not that I'm upset to see the back of October. I never really like the month as it sees the end of summer time, meaning I rarely see the daylight, aside from the office window, or a brief stroll to the sandwich shop at lunch, and usually means weekends are wet, windy, cold or foggy, or a mixture of some of the above. Combine that with the 18th being Mum's Birthday and just over a week later, the anniversary of her death, and I'm not one for smiling much in October. So November might start to bring some more cheer, maybe. October wasn't bad as far as birding went though, with the red kites recently, I actually managed to see a kingfisher for a few moments at Marsh Lane of all places, and then this last weekend, which yielded a couple of gems. 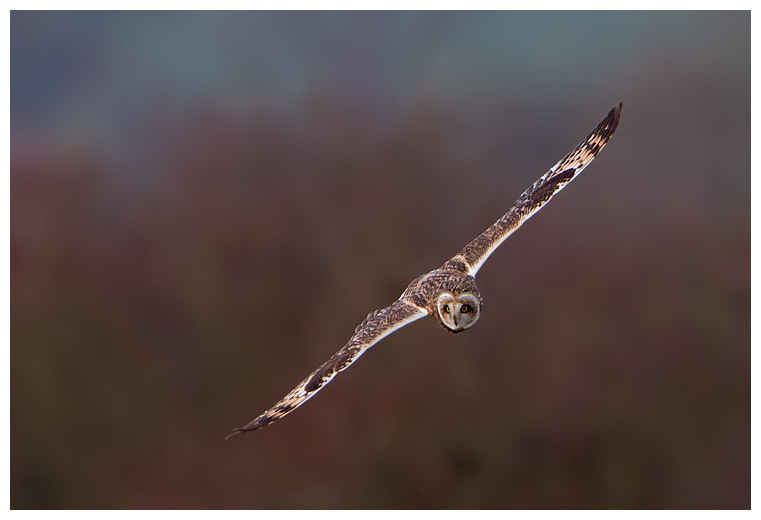 There seems to be a decent influx of short-eared owls currently, with many familiar places reporting them. 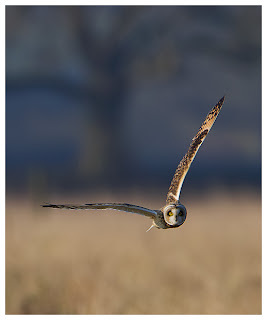 One of the closer spots is in Northants, and as Ian lives local to it, I arranged to meet with him in the afternoon. 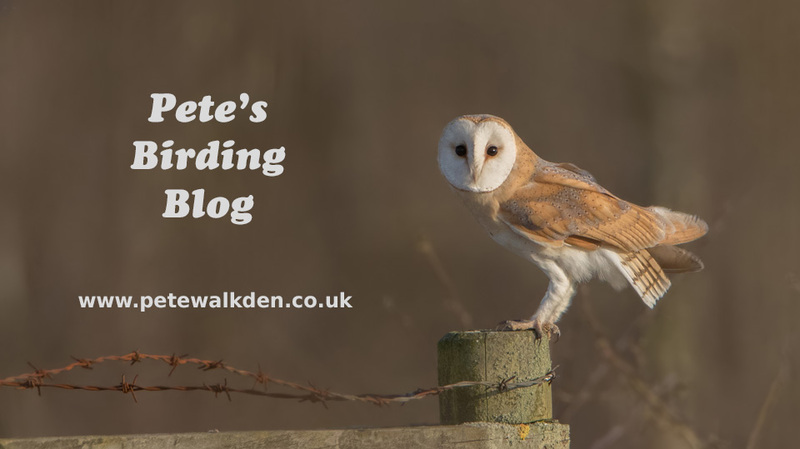 Before heading to the spot, I opted to divert to take a look around Harrington Airfield, which also has a couple of SEOs apparently, and a great grey shrike. Last time we'd been there, I'd made the mistake of carrying my huge camera bag (which weighs a tonne alone) and the walk to and from the car nearly killed me. I swear I was about an inch shorter in height when I got home. 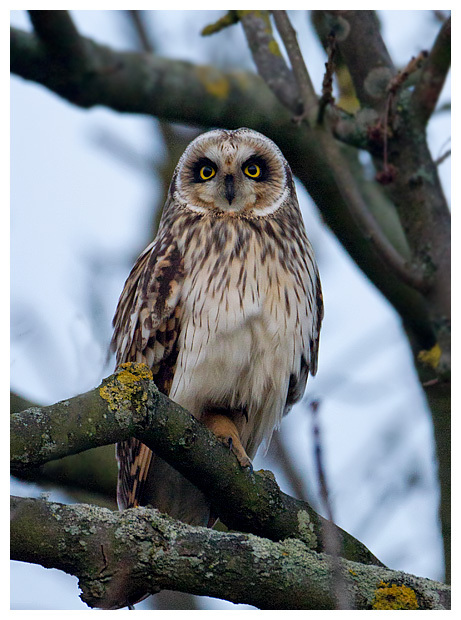 Add to that the weather - freezing and blowing a gale, and with no birds seen, it was one to forget. Airfields tend to be breezy, so that wasn't a surprise this time, but it was a southwesterly, so warm for the time of year. And I'd found somewhere closer to park, so getting to the bunkers was less tiresome too. Finding something point the camera at wasn't so easy. No sign of the shrike, and it was too late / too early to see any owls. 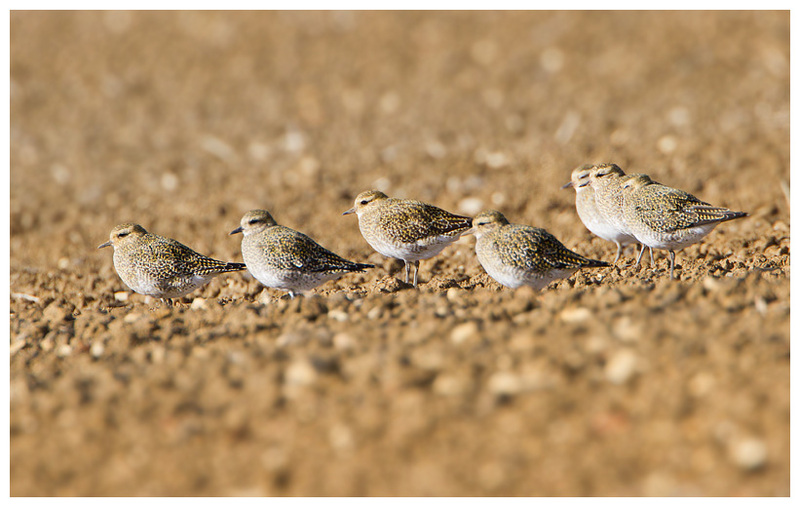 A lone kestrel and a few yellowhammers were all that I saw, until a small flock of golden plover caught my eye. 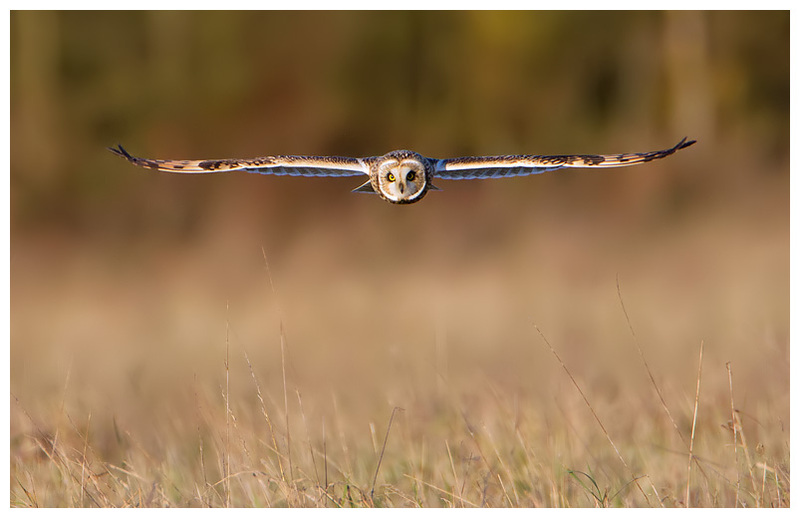 They were down in a dip in the field, so with no cover to use to hide my approach, it was never going to be any good. Was amusing though, in that every time I approached, they would watch, shuffle about and then scurry a bit further away. Unlike the ones on Shetland, which came over to see me! Ah well, I have a few pics of them already, and in better plumage. The breeze was starting to dry out my contact lenses, so I scuttled back to my car for a break, a bite to eat and then the short drive over to meet up with Ian. Parking up, I scanned the fields for any owls but it was really quiet, and save for a few crows and pigeons, there wasn't much to watch at all. 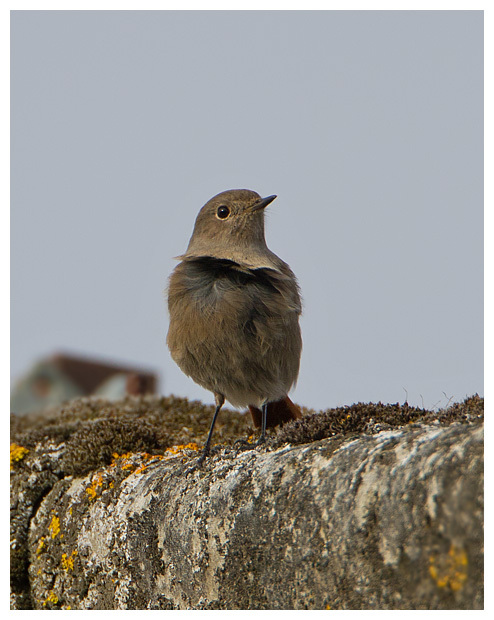 Behind me, on a barn, a pair of pied wagtails called out, and flicked their tails as they chased flies. No sign of Ian either, so I sat back into the car. It was then that I saw something that wasn't expected. 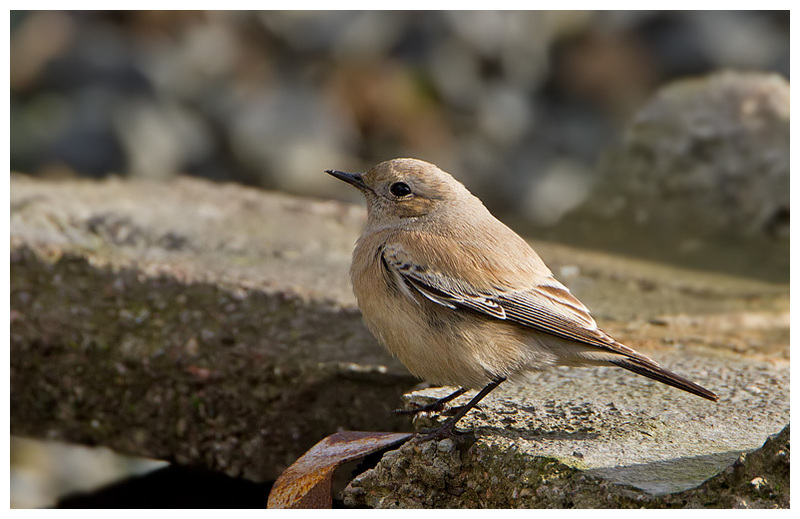 It was near the wagtails, but wasn't one. I did a double take before it dawned on me. A black redstart!! Fantastic. Ok, so it wasn't as accommodating as the one from Coleshill some years back, and it was a juvenile, so not as good looking, but even so, what a great little bird to see. It seemed to favour perching on the top of the barn, which meant shots weren't going to be easy, and as seems to be norm these days, whenever the sun came out, the redstart hid! 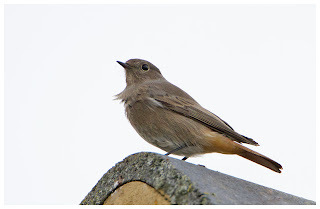 It came fairly close on a couple of occasions though, flicking its tail, showing off that orange / red rear. 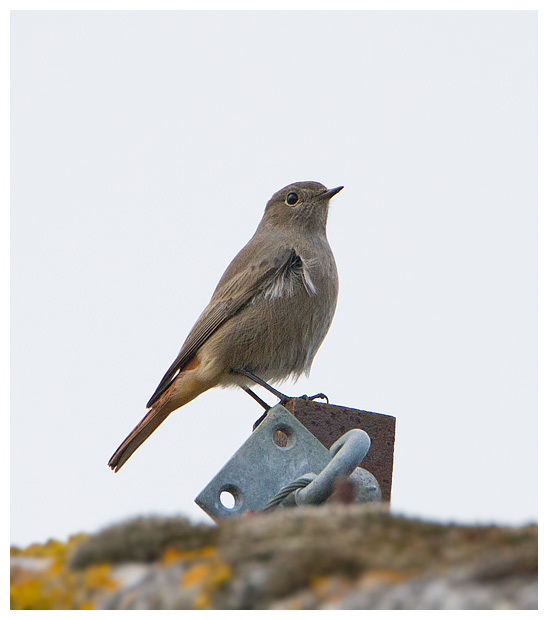 Ian arrived, and the redstart hid from him. Typical! So he sat in the field and watched for owls. Alas it wasn't to be our day. With only a fly-by from a sparrowhawk and no camera to attempt a shot, we left when the light faded. 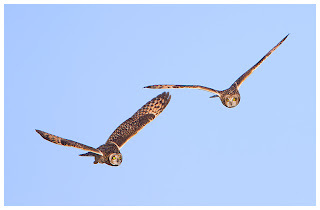 Not to worry though, as there ought to be plenty more chances for SEOs before the winter is out. On to Sunday, and an extra hour in bed. Well, it would have been, had I not been woken by my phone ringing. 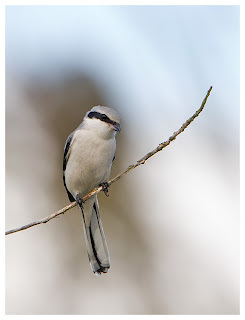 Steve Seal on the line, asking why I wasn't at Cannock for the shrike? I said I'd consider it, but as it was raining outside, I really didn't think I would bother. But, what else was there to do, other than perhaps house work? I was out the door like a shot! Finding the spot wasn't easy, but thankfully Stuart's directions guided me to them, where I found not only Steve and Stuart, but also Ken and Dave, all enjoying fine views of the great grey shrike, and no rain either! 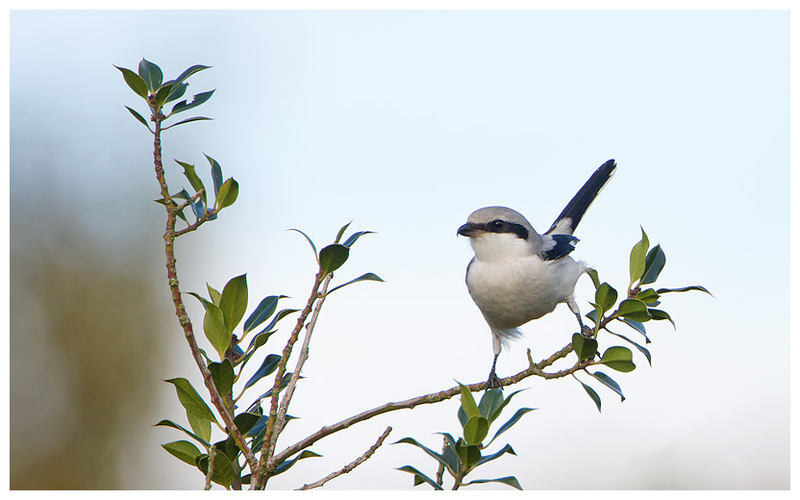 It was perching on the tops of trees, and favoured a holly tree in front of us. After dipping on the one at Harrington the day before, this was a good turnaround of fortune, and I was soon snapping away. Wasps were the dish of the day, and it was very good at catching and then consuming them, without being stung. 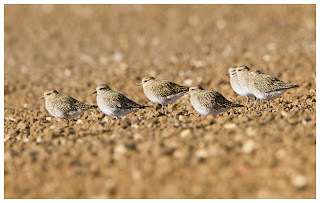 If only pubs would employ these birds to keep the blighters away from pints of ale during the summer! While it didn't come as close as the one at Napton, it was on better, natural perches, and was also eating the prey in full view of us. Strangely, when Steve and Dave headed off, the bird refused to play ball anymore, and didn't return to its normal perch, favouring more distant trees. I must find out what aftershave they use! A good few hours out though, and definitely worth losing the hour in bed for.